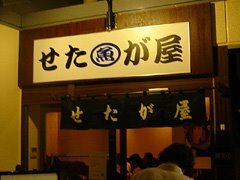 Setaga-ya is a long time ramen shop on Kan-nana road. 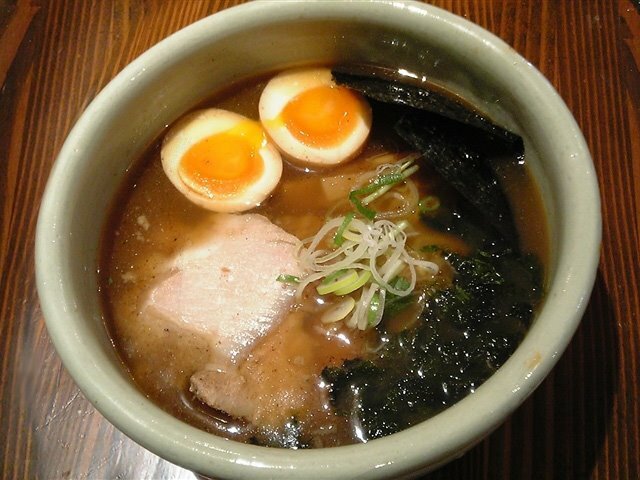 It is famous for its Japanese style, fish based soup. This time I tried out its new shop near Shinagawa station where I ordered the せたが屋らーめん (Setaga-ya Ramen). The Soup - has a distinctly Japanese flair to it, probably a combination of dried sardines, bonito and even dried scallops. There is very little oil in this soup which is a nice change from most of the other ramen now a days. The fragrance of the soup is very strong, letting its presence known even before the first sip. The soup has a slight bitterness to it with a hint of citrus probably from the yuzu. The Toppings - included the standard cha-shu pork, bamboo men-ma, dried seaweed, green onions and mitsu-ba. The cha-shu was very tender, probably roasted slightly before being served. The mitsu-ba provide a strong accent that adds a new twist to the whole ramen, it adds an exclamation mark to my whole experience of this ramen though I suspect that some people might not enjoy it. Overall - one of the best ramen I have had. The soup, ramen and toppings are all excellent, complementing eachother nicely. I will defintely be coming back. Hi.... I am a big Ramen fans. I just tried Setaga-ya ramen shop in NYC, St. Mark are. It was alright. LOve tonkatsu based soup by Ippudo better... Have you tried any ramen shop in NYC?